Enjoy a day trip far away from the hustle and bustle of Tokyo and meet the snow monkey in the beautiful countryside of Nagano Prefecture. Snow monkeys are native to Japan and they get the unique name because the areas in which they live are covered by snow for months every year. 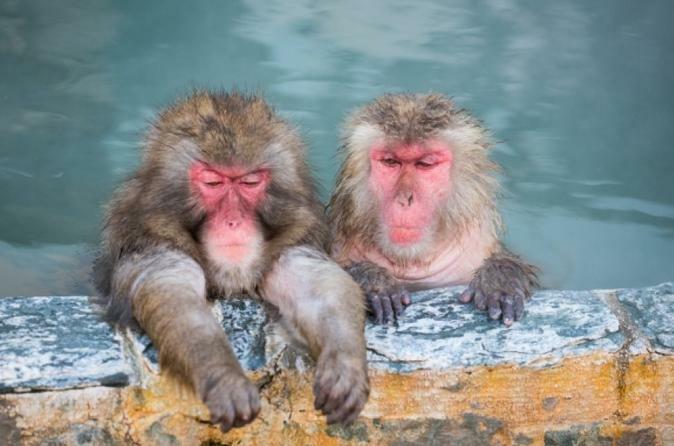 Visit one of the most popular onsen (hot spring) destinations, Jigokudani Onsen, and see the snow monkey family soaking and having a good time. After pickup in the morning in Shinjuku, your tour bus will take you to Nagano Prefecture (approximately 3.5 hours) . you will proceed your journey to the Jigokudani Onsen (Hot Spring). Your tour bus will park in Kamibayashi and you will take a walk to Jigokudani Onsen. In the winter, it might be difficult for the bus to go through the mountain road and the walk may take about 40 minutes. After the relaxing walk, arrive at Jigokudani Onsen. Here, see the beautiful hot spring and its famous snow monkeys. In the winter, due to the cold weather, snow monkeys descend the cliff with their families and soak in the hot spring to keep themselves and their babies warm. Sometimes you might also be able to see the monkeys bathing. After taking photos and exploring the area, walk back to where your bus is parked. On the way back to Shinjuku, stop by the service area for souvenir shopping and take a break. Your bus will return to Shinjuku when the tour concludes.